John McLaughlin is a living legend. His enormous impact to the generations of guitarists over the course of time put his name to the top of the music’s most creative minds. This interview with John McLaughlin was originally conducted back in 2011 and it has been refreshed more than three years later, with addition of new photos. Nick: Hello, Mr. McLaughlin. Firstly, I would love to thank you for finding time to do this interview with ProgSphere. In about a month you’re going to kick off a new North American tour, where you will be promoting your latest studio album “To The One”. How are you satisfied with the album in general? John: Thanks Nikola. About 10 or 12 years ago touring and promotion of a recording would be a correct assumption, but today we’re happy just to make a tour and play some of the music from the CD. Nick: You have said that “To The One” is an homage to John Coltrane’s masterpiece “A Love Supreme”. Tell us more about this. 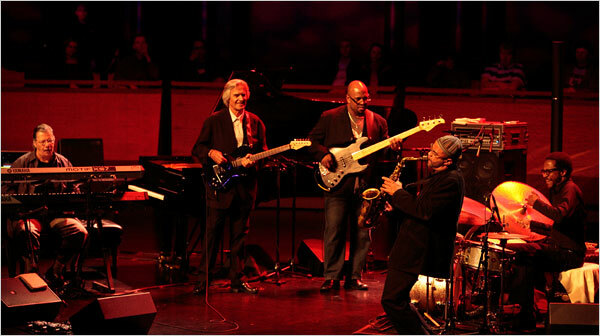 John: In the past I’ve made conscious homage to John Coltrane: he has been, and is today, a source of true inspiration. It was only during the writing of the music in ‘To the One’ did I realize the kind of unconscious homage to John embedded in the music. In addition, there are some analogies in my interior life that coincide. If you see my liner notes you’ll understand. Nick: It’s interesting that you call “A Love Supreme” such a big inspiration for “To the One”, because they don’t share that much musically. Is it more of a spiritual inspiration than a direct musical inspiration? Or perhaps you disagree and I simply don’t understand music theory well enough to comprehend the similarities! What do you say? John: As I mentioned above, I had no thought of making a homage to anyone with this recording. It was only after hearing my writing did I realize that there was such a connection to Coltrane. But you are correct, there’s not much musical reference to his recording, a little but not much. However, as I said above, there is a connection between the two of us in a interior, or ‘spiritual’ way. I use parenthesese since the word ‘spiritual’ has been somewhat misused over the years. There have been events in my life that are similar to events that happened in his own life. Nick: The working title of the album is very interesting for interpretations. In a way, everything people do is done “for” or “to the one” whoever that “one” may be. Themselves, a particular person, a concept, or whatever spiritual figure they might believe in. Or perhaps even a combination. What do you think? John: When I say ‘To the One’, this statement comes directly from my own experience. The One is simply an expression of something that defies ANY kind of word. It is only my personal conviction that all life including all human beings are inseparably united. We cannot be separated except in the individual mind of illusion. We are all of us an integral part of ‘The One’. Only ‘The One’ is. Because of this, how can what we do, be apart from this oneness? Nothing we do is apart from us. Everything you do will effect everyone, and everything to some degree or other. Dan: “To the One” is done in a style that’s similar to some of your other recent albums: “Floating Point” and “Industrial Zen”. I must say I am a big fan of this style, a sort of rhythm-centric jazz fusion format. Could you tell us more about it? Do you plan on expanding upon it more in the future? John: Frankly, I don’t even think or consider where I am going in music. Music will always be true to me and never betray me. I only have to follow my instincts. The style you speak of is part of my history and my future and is continually evolving. I’m very happy you enjoy this music. Nick: What is your way of approaching music in general? Your music often has the rhythm section taking a leading role, but how do you see the harmonic side? Tell us about your approach. John: It’s true that the rhythmic side of music is as important as the melodic and harmonic. But in a way these are only intellectual considerations. Music is wholeness, or should be. Regarding approach: as I mention above, I only go with instinct, but of course, an inspiration can come in a harmonic, melodic or rhythmic way. Basically I wait for the idea to come and then it’s a combination of development, while allowing the integrity of the idea to remain. Every piece is different and demands its own approach. Dan: You have had a very long and prestigious career, and you’ve worked with countless numbers of artists over the years. Who would you say was/is the most fun to work with? Who would you like to work with, but haven’t yet? John: That’s a tough question to answer since all the musicians I’ve worked with and work with currently are people that I love and admire. That said, I could say that working with Miles Davis was probably the most interesting and demanding experience, but also with the late Tony Williams whom I miss dearly, Zakir Hussain who is such a musician and a true brother to me, and I could also say from the point of view of music and laughter, Paco de Lucia. Dan: Speaking of one of the people you’ve worked with, yet straying slightly off topic, I find myself being filled with curiosity about something. I have read that, when attempting to reform Shakti, you could not get in contact with L. Shankar. Would you like to tell us about this situation? It seems interesting that in this day of instant, worldwide communication, one cannot get in contact with an old colleague. Has he always been hard to contact? Have you spoken to him since then? John: L. Shankar was clealy into some other project when Zakir and I tried repeatadly to contact him. Neither of us had any response at all until several months after we had abandoned the idea of him being in the band, when he called us the day we were leaving for a European tour, and Mandolin Shrinivas had already been integrated into Shakti. Very strange that we still today do not understand his attitude. Dan: Continuing on with Shakti… Is there any chance you will do a new studio album with the band? Or was that never the goal when you “reformed it”? Either way, are there plans for more live albums? John: I believe we will make another sudio recording. Shakti in general was an amazing band that played incredibly original music. When describing it to people I say “it’s like Ravi Shankar reconceptualized into a jazz setting, with all of the original motifs intact”. Would you say that’s a fitting description? I did my best! I really don’t mind what you call it! Dan: Where did you get the idea to do something like that? Was it someone else’s idea? How did you get all those amazing musicians like Zakir Hussain and L. Shankar together? John: You should remember that it was around 1972 that I got them together. I’d known Zakir since 1969, and we played together for the 1st time in 1971. I met Shankar during my time as a student of Dr. Ramanathan at Wesleyan University. I was also deeply into meditation under an Indian guru, and personally found that these two musicians were the equivalent of some of the greatest musicians in jazz today. It was destiny is a sense. Dan: It is doubtless that you are one of the most skilled guitarists in the world in the field of jazz, or even in any genre. That said, are there any guitarists whose skills you particularly envy? Who do you think is a better guitarist than you? John: There are many fine guitarists around and each one has something special. As far as envy, no I don’t envy anyone, but don’t forget I’ve been working at my instrument for over 50 years! Dan: Tell us about the types of guitars you use. What do you use for specific purposes, like acoustic, electric, playing more “Hindustani” type stuff with Shakti, more “heavy fusion” stuff like Mahavishnu Orchestra, etc. John: I have electric guitars from Godin, acoustic guitars from Gibson, and ‘classic’ nylon string guitars from Abe Wechter, and a nylon string solid body from Godin. I have several more that I really like over the years. Dan: I think I’m finished with my questions, is there anything else you would like to add? Enjoy you tour of North America, I’m just sad I left the U.S. right before you started it! John: Thanks and best wishes.